﻿ Advanced Metering Infrastructure – KONČAR Elektronika i informatika d.d. 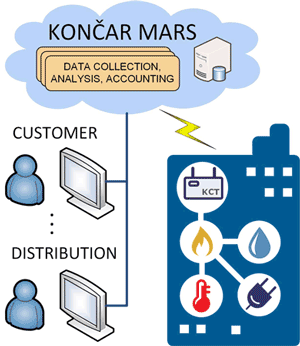 KONČAR AMI (Advanced Metering Infrastructure) is a smart solution for increased savings in Energy Management systems. It consists of devices that collect energy and water consumption data from dislocated meters and send them in the central system MARS (Management and Automated Reading Software). MARS provides the user with an optimal set of data processing capabilities which allow full control of energy consumption as a basic prerequisite for cost savings. Better planning and automation systems. Reducing the number of complaints and related costs. Improving the quality of services and market position. The user pays exactly as much as is spent. Savings of up to 40% (depending on the energy source and how to use). KONČAR AMI is useful for utilities that want an accurate, near real time readings which can be the basis for distributed generation and renewable sources. KONČAR AMI is very useful for the end user who wants to cut costs, prevent unnecessary losses and live responsibly. Why choose KONČAR AMI ? all with the goal of complete control over energy consumption as a basic prerequisite for cost savings. The full functionality is available via a web browser. If opting for Web Hosting, it cuts the installation costs (no investments in servers and network equipment) and operating costs because KONČAR takes care of the maintenance for you. To collect the data: BeeKON basic module (IEEE 802.15.4), Wireless M-Bus, Pulse Inputs and RS-232/485 module. To transfer data to the center: a long-range radio IEEE 802.15.4k, GPRS, Ethernet/ADSL and optional SD cards. In the case of data transfer to the main computer via a long-range radio, the user is exempt from licensing, as well as any costs of a telecom operator, which positions KONČAR AMI ahead of the competition. It’s a device, which is mounted next to the meter with pulse, serial or wireless M-bus output and sends them over the wireless network to a Concentrator. The data can be collected from all types of meters from different manufacturers (meter electric energy, water meters, gas meters, etc.). 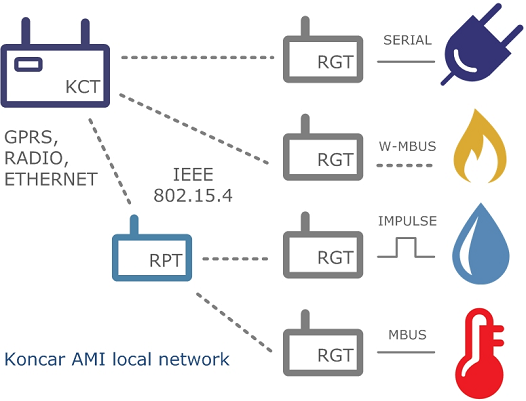 RTG is using local BeeKON network with the frequency of 868 MHz a maximum range of 1 km (LOS – Line Of Sight) and IEEE 802.15.4 protocol to communicate with the master Concentrator. RGT is powered by a built-in battery with a life expectancy greater than 5 years. For use in humid conditions (for example in manholes), the RGT in IP68 enclosure is available. It’s an auxiliary device used to amplify the wireless signal when a Concentrator is outside the range of a Registrar. It uses BeeKON network for communication and a replaceable battery with a life span greater than 5 years. It can be networked with up to 10 subunits, which significantly increases the range of KCT, ie. the range of the local network. Advanced RPMA (Random Phase Multiple Access) technology enables the reception of electromagnetic waves below the level of noise (down to -170 dBm) allowing coverage of more than 12 km with a minimum transmission power (in countries with NIST regulations and over 60 km). Apply advanced measurement immediately, enjoy the return on investment forever.